Looking for an established, dependable moving company to safely move your home or business? 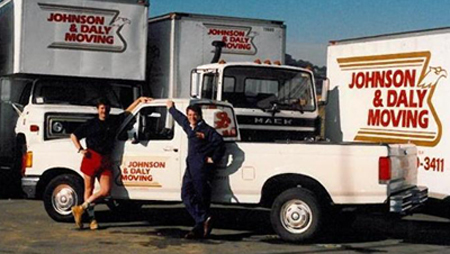 Johnson & Daly Moving and Storage has been serving Marin County and the San Francisco Bay Area for over 38 years. We offer a full-service moving experience, providing assistance with every aspect of your move from start to finish.The most relaxing move you'll ever experience. Rest assured, your belongings are safe with us! Our 150,000 sq.ft. Storage facility comes equipped with a State of the art security system, on site security, industrial earthquake protection, and the latest in fire prevention systems. Safety is our number #1 concern. We offer crating and packing services for entire houses or the most delicate of possessions. Art, chandeliers, custom furniture, or statues, we're prepared to accommodate them all. During the off season, keep your toys pristine. All of our storage is indoors and our warehouse can accommodate all types of personal or recreational vehicles. Over the last 38 years, we've seen it all. We have a selection of unique equipment necessary for any special move. We can move gun safes, industrial equipment, pizza ovens, and any piano. For fastest response, call us at (415) 491-4444. You may also request an estimate using any form on our website, and we'll get back to you as soon as possible. Thank you for choosing Johnson & Daly Moving & Storage. One of our move coordinators will contact you as soon as possible!